On the 8th of April, 1961, Helen Keller and her personal secretary, Evelyn Seide, met with President Kennedy. Abbie Rowe, a White-House photographer, took the picture from which this image is cropped. The photo is online via the JFK Presidential Library and Museum. 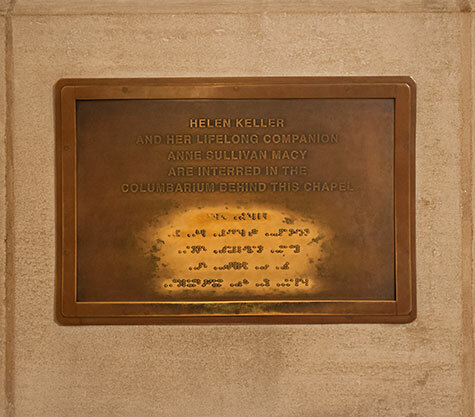 Click on the image to see more closely how Ms. Keller communicated via finger-spelling. After Polly Thomson died, Helen Keller continued to make appearances until she suffered her first stroke, in October of 1961. The next year, a film version of The Miracle Worker (with Anne Bancroft and Patty Duke) was released. It won Oscars for both stars. Although retired from public life, Helen received America's highest civilian honor - the Presidential Medal of Freedom - in 1964. A year later, she received another honor when she was elected to the Women's Hall of Fame. Helen's long and eventful life closed on June 1, 1968, when she died in her sleep. The ashes of this remarkable 88-year-old pioneer were interred at America's National Cathedral where they now rest (in the Chapel of St. Joseph of Arimathea) between those of two other special people - Annie Sullivan and Polly Thomson. (But I remembered Milton's Paradise). (Beethoven came and wiped away my tears). (But I had talked with God when I was young). Possessing that, I still possess the whole. Bos, Carole "THEY DID NOT TAKE MY SOUL" AwesomeStories.com. Feb 01, 2009. Apr 20, 2019.